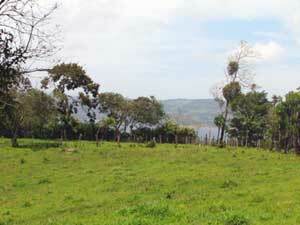 Located 2 miles West of the town of Aguacate, this is a beautiful, quiet retreat away from noise with a view of the volcano and within view of Lake Arenal. 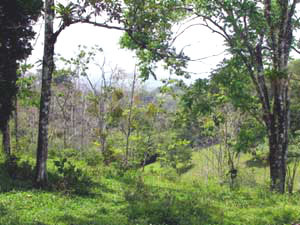 Most of the 2.2 acres is level, has lots of native trees, and affords multiple building sites. The gravel road is owned and maintained by the municipality. The property is at the corner of the road and a grassy lane that serves three of the four lots on this headland. 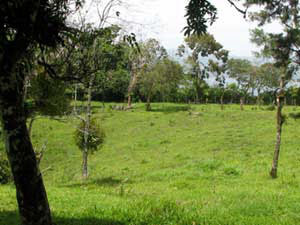 A water line is present on the property and is fed by the Aguacate Water District known to provide very pure, spring-fed water. Currently no power is on the immediate property however there is a line and transformer at the main road, 1/2 mile away. Presently four Americans own property on this road. Discussions have been proposed in sharing the estimated cost of $20,000 for this project. 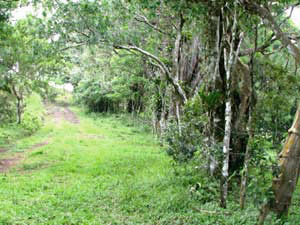 The lot is one of 4 large lots that occupy a beautiful, tranquil headland less than 15 minutes from Nuevo Arenal. Here are several views of the terrain and vistas on this well situated property, including the entrance lane . While the majority of the lot is nearly level, there are interesting areas of forest and hillside as well as focal points onscattered trees. 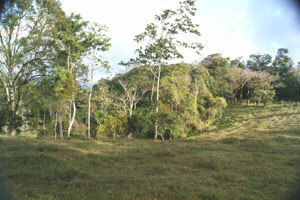 This very private area is home to wildlife such and monkeys, sloths, and many varieties of birds. 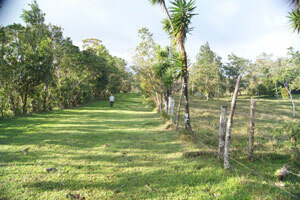 This grassy lane leads to three of the four lots on this headland. The lot for sale is on the right.